Adams has crafted an exciting mystery romp set at the end of December 1899. The body of young Hilary De Montfort is found horribly battered. 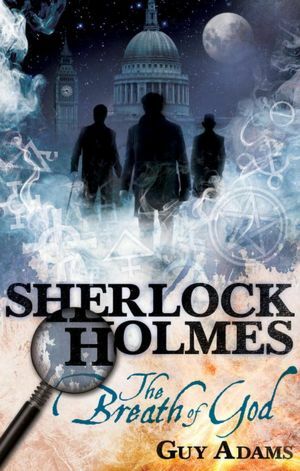 A mysterious man, Dr. John Silence, obtains an appointment with Sherlock Holmes and passes on a warning about the Breath of God, a strange, vindictive tornado made from the souls of the dead. As it is soon discovered, both Montfort and the newly dead Lord Ruthvney are members of the Hermetic Order of the Golden Dawn. Holmes and Watson travel north to Inverness to visit Aleister Crowley at Boleskine. Within hours the mansion is under an occult attack by an angry MacGregor Mathers and his minions. Or is it? Adams skillfully weaves the real Aleister Crowley with the fictional Sherlock Holmes and Dr. Watson. The author makes full use of his literary license by also including the fictional characters Julian Karswell (from author M. R. James), Van Helsing’s protégée Thomas Carnacki (from author William Hope Hodgson), and Dr. Silence (from author Algernon Blackwood), a psychical doctor much like Dion Fortune’s Dr. Taverner, to plump out the cast. Through the plot’s supernatural twists and turns, Watson struggles to find understanding. Sherlock Holmes remains bracingly skeptical. Adams doesn’t attempt a slavish imitation of Doyle’s style. Although in Doyle’s mystery series, Holmes only rarely encounters the supernatural; but in fact, Arthur Conan Doyle became quite interested in spiritualism after the death of his son. The HOGD and other secret occult societies were precise contemporaries with the Sherlock Holmes stories. This is, perhaps, the reason occult characters and elements are fused into new Holmes stories, including the films by Guy Ritchie featuring Robert Downey Jr. as Holmes and Jude Law as a brawny, macho Watson. An enduring and popular sleuth with incredible powers of deduction, Sherlock Holmes remains the quintessential detective. The publisher, Titan Books, offers a series of almost twenty post-Doyle Holmes mysteries. No, it’s not Sir Arthur, but Holmes is still lots of fun for readers. This is a great book for steampunk fans and those who would enjoy a fusion of the very real occult society of the Golden Dawn and its most notorious member, Aleister Crowley.